In the wake of the worst floods Japan has seen in more than 35 years, International Medical Corps has deployed an assessment team from its Tokyo office to some of the most flood-affected areas. The team is working in support of the Government of Japan and local officials to identify the most pressing needs and find ways to provide relief to those still staying in evacuation centers. International Medical Corps is responding in Uwajima, one of the areas hardest hit by the floods. Our teams have already delivered our first 100 mattresses and basic supplies for those stranded in evacuation centers. As many of those affected are elderly, our assistance is crucial to prevent further injury and improve living conditions. With hundreds of children displaced, International Medical Corps also provided support to create safe and friendly spaces for girls and boys, including activities such as storytelling and games, helping children recover. Moving forward, we are looking towards working with local organizations and facilities to provide additional care and increase evacuee children’s well-being as their parents work to repair their damaged homes. International Medical Corps, together with local authorities and organizations, responded to the needs of those displaced by the twin Kumamoto earthquakes in April 2016, reaching approximately 2,500 people with relief and recovery efforts across 20 evacuation centers. International Medical Corps’ emergency response team was on the ground 48 hours after the 2011 earthquake, tsunami, and nuclear crisis at Fukushima, working in support of the Government of Japan and local partner organizations to provide relief and help communities with longer-term recovery. 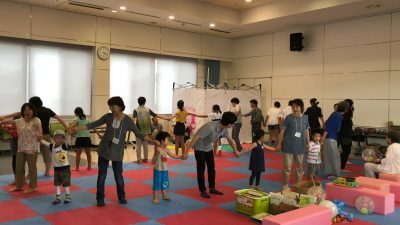 International Medical Corps is providing activities for mothers and children who have been affected by flooding and landslides in Japan.